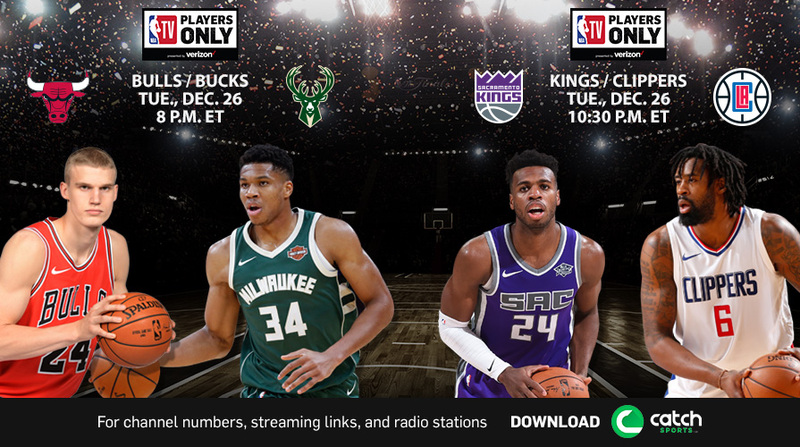 NBA TV will showcase some of the league’s top stars in action around the holidays including four doubleheaders beginning tonight, Wednesday, Dec. 20. The network’s upcoming live game schedule will feature Cleveland’s LeBron James, Oklahoma City’s Russell Westbrook, Golden State’s Kevin Durant, Houston’s James Harden, Washington’s John Wall and Milwaukee’s Giannis Antetokounmpo, among others, over the next two weeks of coverage. 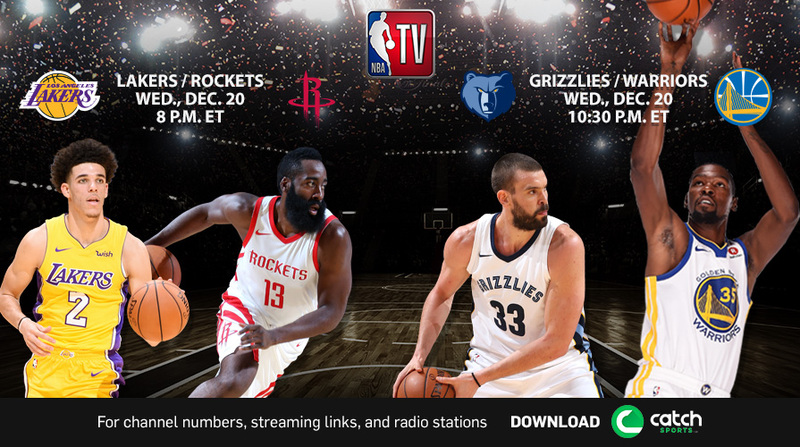 The network’s series of upcoming doubleheaders will tip off tonight with the Houston Rockets and James Harden hosting the Los Angeles Lakers and Lonzo Ball at 8 p.m., followed by the Golden State Warriors and Durant hosting the Memphis Grizzlies and Marc Gasol at 10:30 p.m.
Live game action will continue on NBA TV with the first night of back-to-back doubleheaders on Tuesday, Dec. 26, as the Milwaukee Bucks and Antetokounmpo will host the Chicago Bulls and Lauri Markkanen at 8 p.m. as a part of Players Only coverage. Later that night, the Sacramento Kings and Buddy Hield will visit the LA Clippers and DeAndre Jordan at 10:30 p.m.
An interconference showdown will tip off the next night’s coverage on Wednesday, Dec. 27, at 8 p.m., with the Oklahoma City Thunder and Westbrook hosting the Toronto Raptors and DeMar DeRozan, followed by the Utah Jazz and Donovan Mitchell visiting the Warriors and Durant at 10:30 p.m. The Rockets with Harden and Chris Paul will visit the Washington Wizards with Wall and Bradley Beal on Friday, Dec. 29, at 7 p.m. Live game action will continue on Saturday, Dec. 30, with the Philadelphia 76ers and Ben Simmons visiting the Denver Nuggets and Nikola Jokic at 9 p.m.
A meeting between top-10 scorers James and Damian Lillard will be the centerpiece of Players Only coverage on Tuesday, Jan. 2, at 7 p.m., as the Cavaliers host the Portland Trail Blazers. Live game coverage will continue with the Grizzlies visiting the Clippers at 10:30 p.m.
• A new series – What If – will debut on Thursday, Dec. 21, during NBA GameTime at 7:30 p.m. The first vignette will examine how the Orlando Magic and Warriors would’ve fared if the blockbuster Chris Webber-Penny Hardaway Draft day trade in 1993 never occurred. What If featurettes will also available via NBA.com and social media. • Last night, NBA TV premiered its first episode of Players Only Monthly, a new series offering insights into the game from the athlete’s perspective. 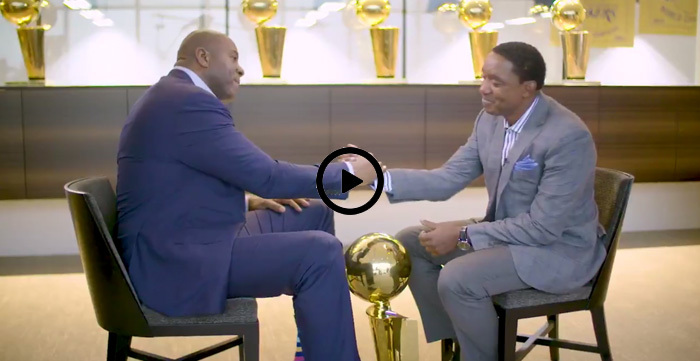 The hour-long installment featured a wide-ranging and emotional sit-down interview between friends and former fierce competitors Magic Johnson and Isiah Thomas. • NBA TV will offer two full days of original programming on December 24-25, including the premiere of Hoops Africa, Ubuntu Matters (Dec. 24, 1:30 pm ET) a documentary spotlighting basketball's impact on society and the development of the sport on the African continent. Additional programming highlights during the Courtside Cinema marathon include The Dream Team, The Doctor, The ‘84 Draft and Clutch City.